the northern part of Eastern Desert as suggested by 1,2. ocene time and follow in most cases, major faults 2. Um Zeita morpho-structural province (Figure 1). 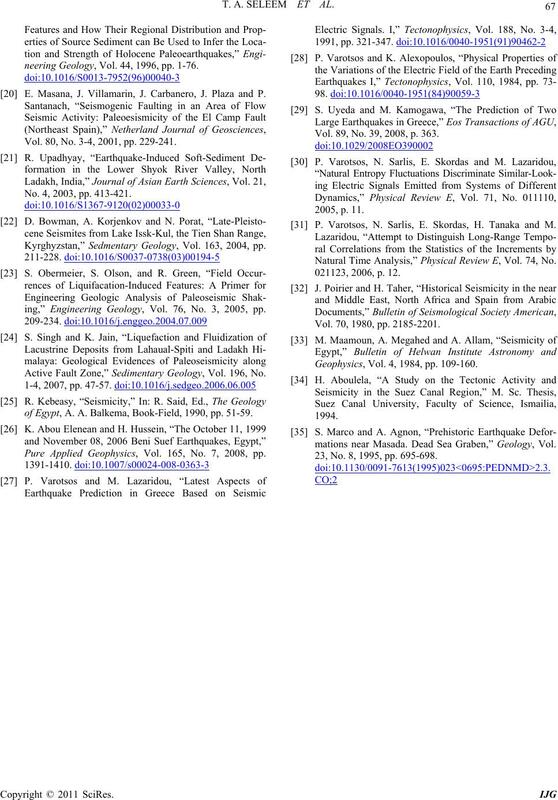 T. A. SELEEM ET AL. Figure 1. Location map showing the study area and its surroundings. a spatial resolution of 90 m*90 m.
Figure 2. 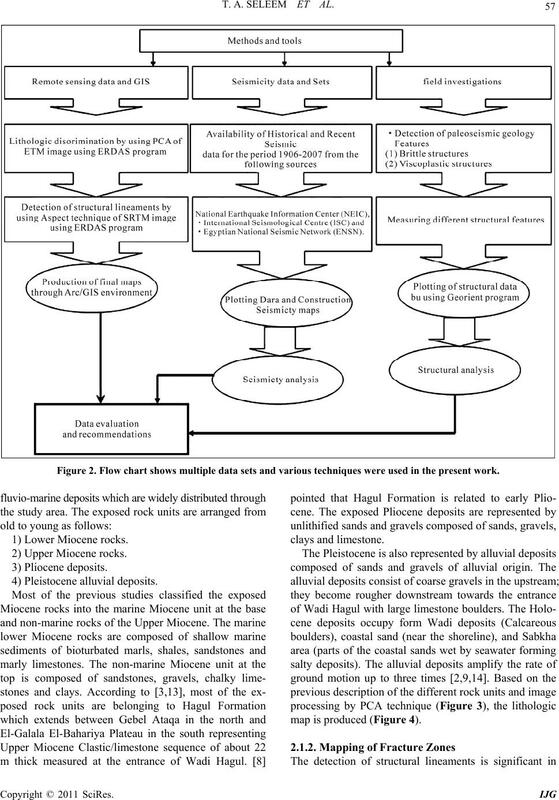 Flow chart shows multiple data sets and various techniques were used in the present work. map is produced (Figure 4). deformation including seismic activity of earthquakes. extracted from enhanced ETM image. earthquakes swarm for a period of more than 2000 years. period 1904 to 2007 is summarized in Figure 7.
age; (b) Rose diagram of extracted structural lineaments. ity data will be represented in the following paragraphs. zone causing seismic activity in Wadi Hagul. study area and its surroundings. width of the fault zone has an average width of 15 meter. of N70˚-80˚W, followed by an almost E-W direction. by tectonics of the Cylsmic trend described by 25. from the site of Hagul fault). 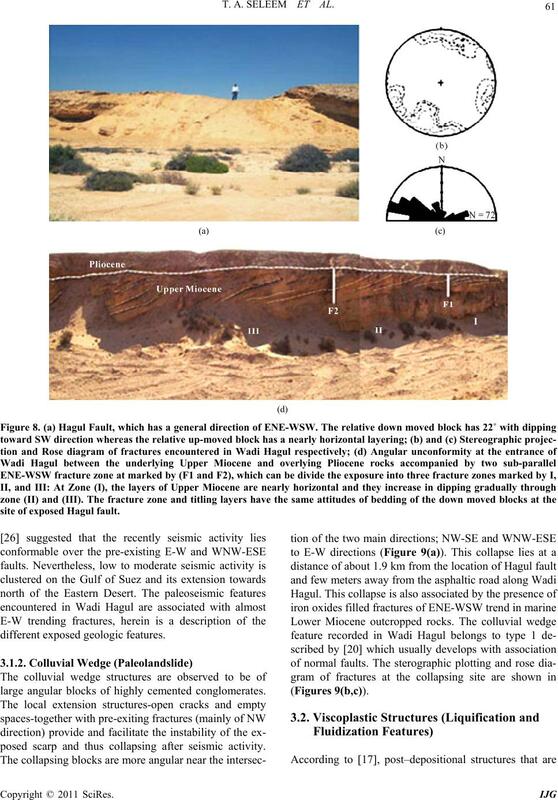 site of exposed Hagul fault. large angular blocks of highly cemented conglomerates. posed scarp and thus collapsing after seismic activity. Rose diagram of paleo-landslide fractures, respectively. water, occur commonly in fine-to medium-grained sand. frequency (≤ 1Hz) signals that precede earthquakes 28. range of few centimeters as shown in Figures 11(a,b). examples in 1111, 5, 26; 1364, 11, 28; and 1512, 4, 7). 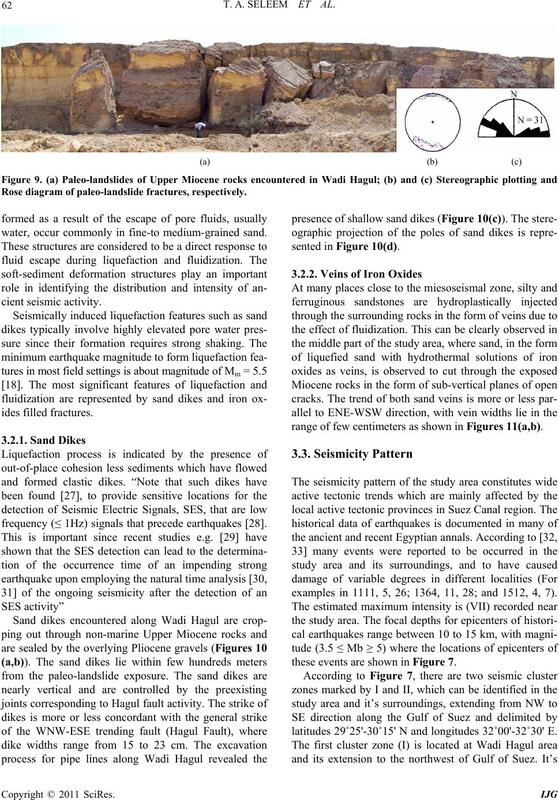 these events are shown in Figure 7.
latitudes 29˚25'-30˚15' N and longitudes 32˚00'-32˚30' E.
reveals the existence of shallow subsurface sand dikes; (d) The stereographic plotting of the poles of sand dikes. Figure 11. (a) Iron oxides filling fractures of ENE-WSW direction; (b) A close up view of a part of the exposure. in the west Bitter lakes by a magnitude of 4.5 (Figure 7). served in the field; the brittle and viscoplastic features. features of sand dikes and veins of iron oxides. earthquakes in the study area and surroundings. average focal depth in the study area and it's adjacent. parallel to the ENE-WSW trending one. tance of about 8 km. 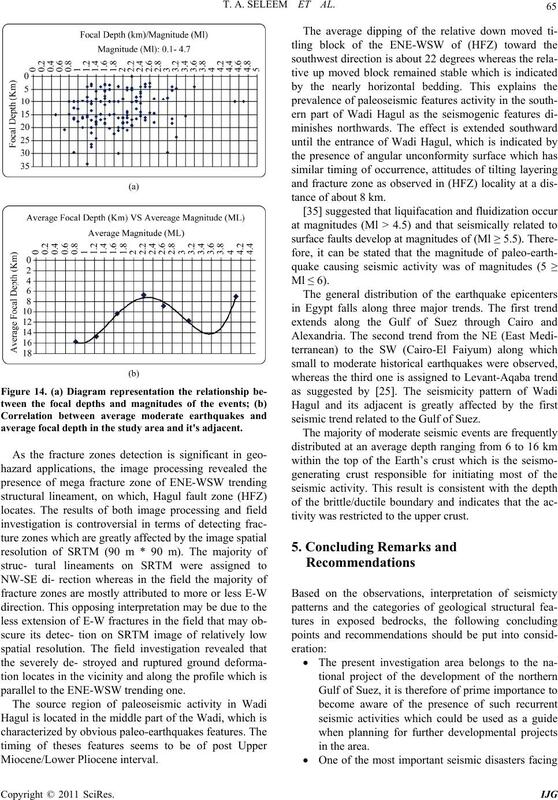 seismic trend related to the Gulf of Suez. tivity was restricted to the upper crust. ble future seismic activity which may be occurred. 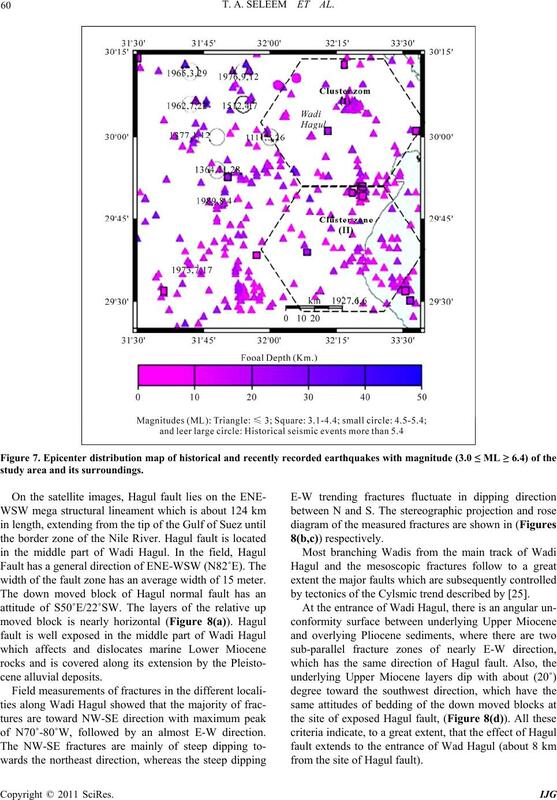 of the paleosesimic activity features. Galala El-Bahariya and Gabal Okheider, Egypt,” Ph. D.
Thesis, Ain Shams University, Cairo, 1993. Suez),” Egypt Survey Department, Cairo, 1926. 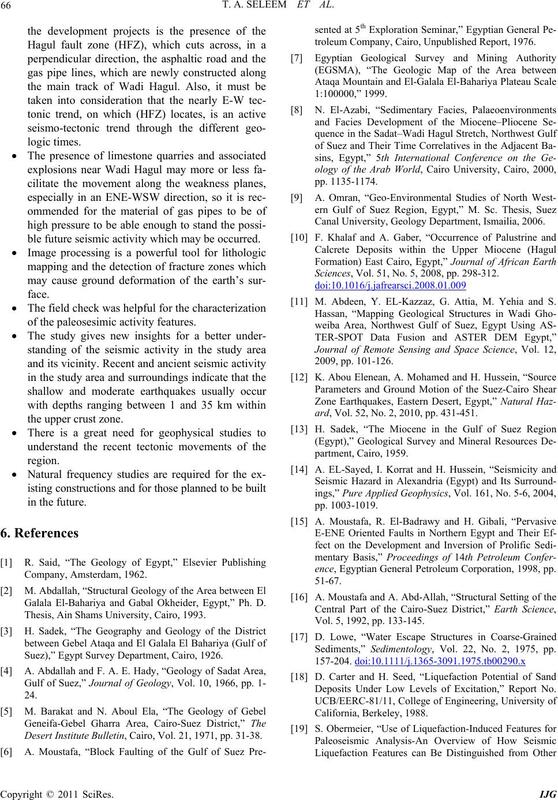 Desert Institute Bulletin, Cairo, Vol. 21, 1971, pp. 31-38.
troleum Company, Cairo, Unpublished Report, 1976. Canal University, Geology Department, Ismailia, 2006. Sciences, Vol. 51, No. 5, 2008, pp. 298-312. M. Abdeen, Y. EL-Kazzaz, G. Attia, M. Yehia and S.
ard, Vol. 52, No. 2, 2010, pp. 431-451.
ence, Egyptian General Petroleum Corporation, 1998, pp. Vol. 5, 1992, pp. 133-145. 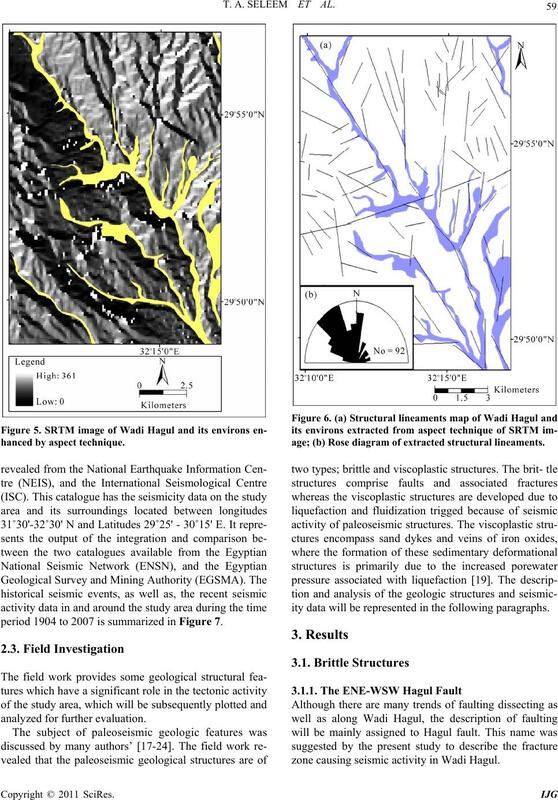 Sediments,” Sedimentology, Vol. 22, No. 2, 1975, pp. Deposits Under Low Levels of Excitation,” Report No. neering Geology, Vol. 44, 1996, pp. 1-76. E. Masana, J. Villamarin, J. Carbanero, J. Plaza and P.
Vol. 80, No. 3-4, 2001, pp. 229-241. No. 4, 2003, pp. 413-421. 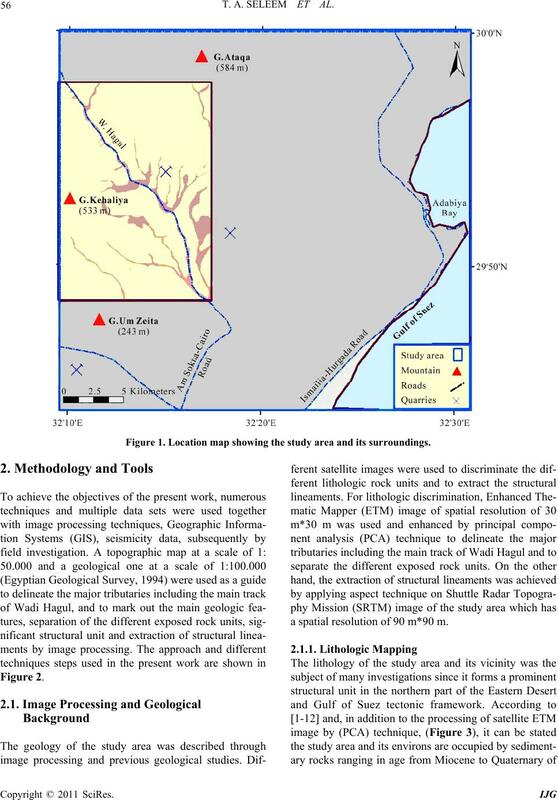 Kyrghyzstan,” Sedmentary Geology, Vol. 163, 2004, pp. ing,” Engineering Geology, Vol. 76, No. 3, 2005, pp. 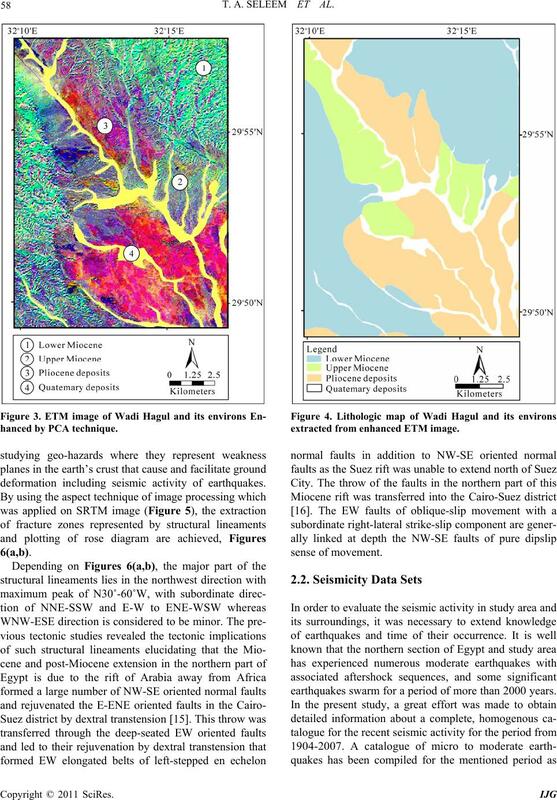 Active Fault Zone,” Sedimentary Geology, Vol. 196, No. of Egypt, A. A. Balkema, Book-Field, 1990, pp. 51-59. 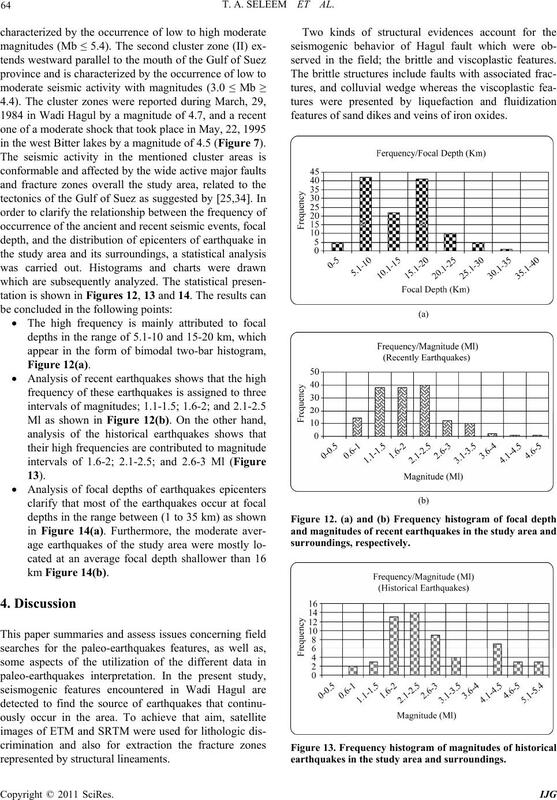 Pure Applied Geophysics, Vol. 165, No. 7, 2008, pp. Vol. 89, No. 39, 2008, p. 363. P. Varotsos, N. Sarlis, E. Skordas, H. Tanaka and M.
Natural Time Analysis,” Physical Review E, Vol. 74, No. Vol. 70, 1980, pp. 2185-2201. 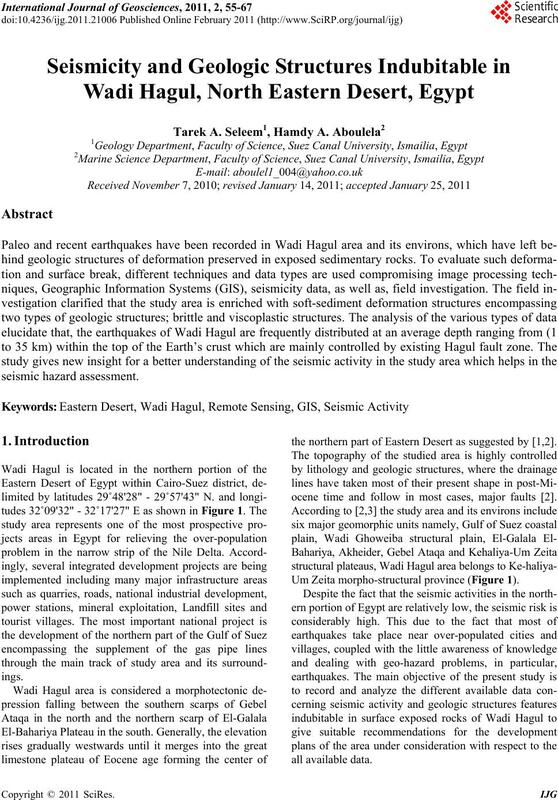 Geophysics, Vol. 4, 1984, pp. 109-160.
mations near Masada. 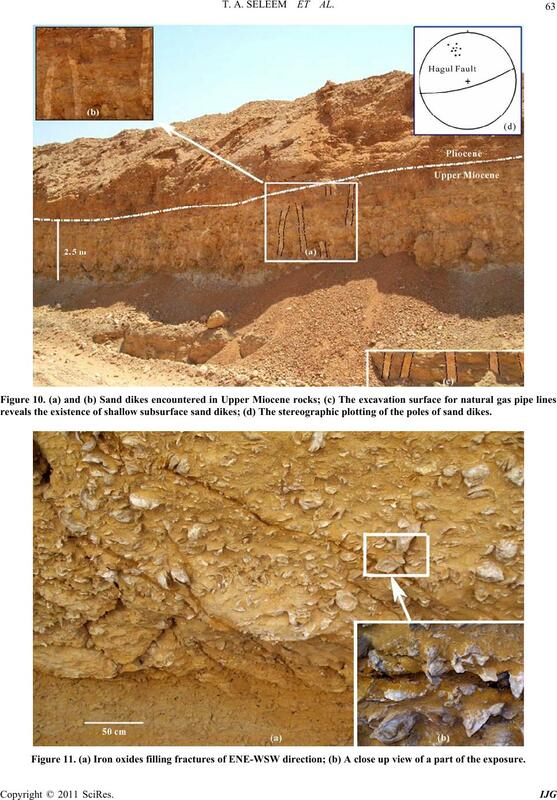 Dead Sea Graben,” Geology, Vol. 23, No. 8, 1995, pp. 695-698.